Now you can fully enjoy your aquatic activities and stay connected! With a smooth and buoyant design, there is no more worry about your phone sinking to the bottom of a swimming pool, lake, etc. 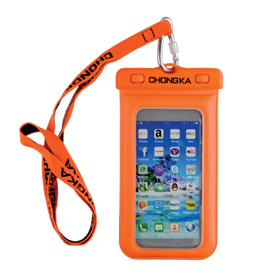 If your phone does fall into the water, it will be encapsulated in the floating waterproof case which will return to the surface within seconds! This unique waterproof case fits all devices up to 6 inches. Once the phone is inserted, simply turn the 2 clasps that tightly seal up the case. In addition to keeping your phone dry, the spacious interior of the case allows you to carry cash, credit cards, id cards, and more. Black neck strap; to add an armband strap, add $2.68(C). 8 colors--black, white, blue, magenta, yellow, purple, gold, and silver. 50.00 (G) plus set-up. Set-up is not charge again on order. Adds 2 weeks to delivery. 3 weeks after artwork or sample approval. Shipping weight is approximately 21 lbs per 100 pieces.